The job interview is stressful enough when you are preparing for a one-on-one discussion with someone from human resources, a potential supervisor or even the CEO, but imagine if you had to interview with all three (maybe even more) at one time. While the phone interview has fast become the norm for quickly scanning job candidates, panel interviews have slowly become more common as companies look to speed up the hiring process by only inviting applicants they feel have the best shot of getting an offer. That’s good news, but good news doesn’t help you deal with the utter fear one might feel going into such a unique situation. 1. Do Your Research – This is something we advise for every job interview, but when you are going to be interviewed by several people at one time, it’s important to make sure you are thorough in your research. When they ask questions about your knowledge of the company, you may be able to slip a lazy answer by one individual, but you’re not going to get away with it in front of a group. Someone may call you out and ask you to elaborate on your answer, so be prepared. In addition, if possible, make sure you know ahead of time who will be interviewing you, so you can plan your research a little better. If you’re meeting people from sales and marketing, you may want to look into those areas of a particular company as part of your research. You may also want to pull some information on the individuals you are meeting with so you can look for common interests you can leverage during the interview. It never hurts to connect with your interviewers. 2. Stand Up And Greet Each Interviewer – You are greeted in the lobby and brought into a conference room and told to take a seat while they bring everyone into the room. You’re getting comfortable when a group of people come in. More than likely, they will gather around you to greet you, but at times, they may start making their way to a seat as they prepare to interview you. Regardless, make sure you stand up and make the effort to greet everyone with a handshake. Look them in the eye, smile and make sure you remember their names, because you may want to address them at some point during the process. 3. Scan The Room While Making Eye Contact – Normally, when you are asked a question, you answer the person who asked it, making direct eye contact with them during the conversation. A panel interview is different. One person may ask a question, but everyone in the room wants to hear your answer. When you deliver your response, make sure you make eye contact with others in the room. It may be awkward to look each person in the eye as you deliver your answer, but, by the end of the interview, you need to make sure you’ve shown respect to everyone, including the guy who makes you feel uncomfortable with his menacing scowl. 4. Ask Questions…Differently – You should always come prepared with some questions for a job interview and avoid questions about salary and benefits. Always ask questions about the company and the role to demonstrate your interest in the position and your knowledge of the job. 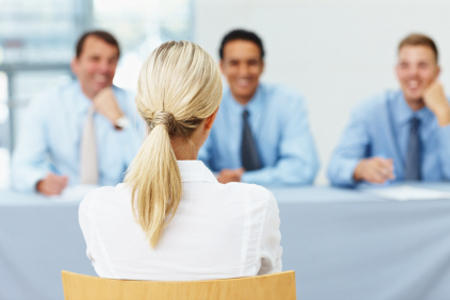 But, when it comes to the panel interview, you should do things a little bit differently. While you should come prepared with questions, look for moments where you can tie those questions to something one of the interviewers said and then ask that question while identifying the person and their statement. This demonstrates that you were paying attention and gives off the impression that something said sparked your interest. In addition, by making sure you mention statements made by your interviewers, you are connecting with them in a way that will help your chances at getting the job. 5. Follow Up With Everyone – It’s important that you get the business cards of everyone in the room. If they didn’t bring it with them, make sure you ask for their email address before you go. They may not feel it is necessary to provide it, but you should still make every effort, because the follow-up rule that applies to a one-on-one interview also applies to panel interviews. And when you follow-up, try to reach out to everyone individually. Don’t write a canned response to everyone, because they may compare notes. Try to connect with each individual in a way that shows them that you were paying attention, giving their questions some thought and identifying with each individual’s particular view. And, if they do compare notes, the thought you put into making each email specific to the person you were contacting will help you stand out from your competitors. Like What You Read? Sign Up for our Newsletter. Follow Vault on Twitter and Instagram.